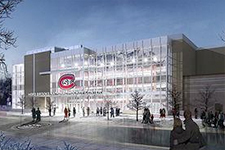 This facility provides two Olympic size hockey rinks for instruction, recreation and intercollegiate athletics. The National Hockey & Event Center was built in 1989. From 5th Avenue, 5th Avenue merges with 4th Avenue between 11th and 12th Street South. The National Hockey Center is located at the corner of 4th Avenue and 12th Street. The nearest public parking is the 12th Street/3rd Avenue metered T lot or the 9th Street/4th Avenue pay lot. Street parking or Special Event parking may also be available.